Bolsa para computadora portátil de 17,3" de largo x 4,7" de ancho x 12,6" de alto. Se adapta a portátiles de 15,6 pulgadas y portátiles de doble asa ajustable de 12,2'C14,6", ideal para bolso de hombro o bolso de mano. Diseño de múltiples bolsillos: un amplio interior y bolsillos con gran capacidad para asegurar una organización sin esfuerzo durante todo el día. Práctico y profesional: cierre de cierre suave fácil y rápido acceso al interior y mantiene tus artículos seguros. El acolchado de espuma suave profesional proporciona más protección a tu computadora portátil/portátil. 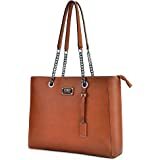 Elegante bolsa para computadora portátil para mujer, hecha de piel sintética rica y material de tono gris para adaptarse al trabajo y los elementos esenciales personales. Regalo perfecto para el día de la madre. 100% garantía de devolución de dinero y devoluciones si no estás satisfecho con nuestro producto. Proporcionaremos el mejor servicio de atención al cliente. Vendido y enviado por A.S.M. GLOBAL desde Canadá. PRODUCT FEATURES 1.DURABLE AND HIGH QUALITY-Travel duffel bag made of water resistant, practical, super soft nylon fabric, highly durable and stylish. Easy to carry and wipe clean. 2.LARGE CAPACITY AND LIGHT WEIGHT-Multiple pockets design, one main zipper compartment, two interior slips, one back side zipper inner pocket, two front zip pockets, one back zipper pocket, two side velcro pockets perfect for items like bottles or umbrellas. More convenient and more easier to organize your stuffs, lightweight, foldable and compact. 3.FOLDABLE AND STYLISH-This sports bag is very easy to carry and packed, saves a lot of space and large capacity to allow your clothes, shoes and other gear accessories. 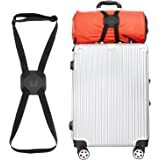 Gym bag can be folded up super small, which is is a convenient choice for your everyday activities, overnight, sports, gym, weekend and vacation. 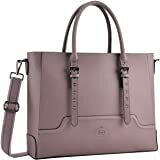 4.VERSATILE USAGE-Dual top handles and a detachable, adjustable shoulder strap for convenient carrying options. Perfect for yoga, gym, sports, travel, luggage, carry-on bag, camping, etc. PACKAGE INCLUDES: 1 x Duffel Bag ( 1 shoulder belt included) ABOUT US ZYSUN-The brand is committed to the pursuit of keeping in touch with the sense of fashion design, which combines the styles of Italian Romance, Mediterranean Amour, Elegant Roman Holiday, etc. 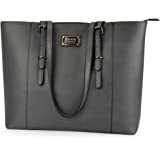 Our aim is to create women's tote handbags, cross body bags, duffel bag, travel bag, weekend bag, etc with "personality, fashion, casual, and comfort"
I do love my Mac book pro tote bag. The weight is distributed nicely, I feel that my computer is protected and the organizing pockets are perfect. I have had it for 6 months and it looks like new. Would highly recommend. A 42 personas les resultó útil. 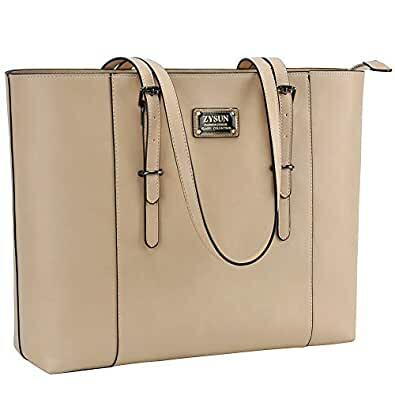 Not only this bag attractive and a nice size, the customer service is remarkable. I received a bag with faulty stitching and dents from the shipping process and it was immediately replaced no questions asked. The kind company rep didn’t even ask me to send the old bag back. They assured me this was a defective item and their quality since approved. It absolutely has and i appreciate friendly service, honesty and a company that stands behind its product. The bag helps me organize the many items I have to take to work with me, a dell laptop, pencil case, notebook, water bottle, wallet, and makeup. It looks just as nice as a more expensive designer bag and I like that it has a built in compartment to keep my laptop safe. The emblem on the bag is pretty and the grey color matches all my outfits. Living up in the Northwest, majority of the days you are stuck wearing a coat and it rains majority of days so I need a bag of trades that goes easily over my arm while wearing my coat. And this is perfection. The straps are adjustable!!! I have big arms and it is really hard trying to find a purse that I can put over my shoulder one hand. A 25 personas les resultó útil. 5.0 de 5 estrellasYour search is over!! This bag is perfect. I searched & searched & bought multiple bags. This is the winner, by far. 1. There is room for everything. 2. The top zips closed so your stuff doesn't fall out. 4. Very well made, quality material, stitching, & metal zipper... no crappy plastic zipper. 5. Customer service is insanely responsive. Somehow I received 2 of the same bag & even though I messed up & let the return by date pass... I emailed & within 24 hours I had my return/refund approved. I LOVE this bag & will be purchasing another color soon! 5.0 de 5 estrellasAbsolutely love!!! Perfect work bag! I was shocked by how much I love this bag! It fits a deceivingly high amount of things while still looking sleek and slim. Plenty of padding for you laptop. My Dell latitude e7450 easily fits! The long straps are so nice - they make it easy and comfortable to carry while also having room to loop a blazer or jacket over your bag. Also love that it can be pretty full but still easily zip shut. Gotten lots of compliments so far! A 17 personas les resultó útil.